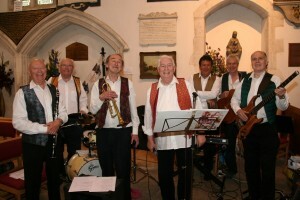 Cookham’s Holy Trinity Church Eucharist service was transformed on Sunday 14th May with the introduction of jazz before, during and after the service. Parishoners were welcomed to the Festival Jazz Eucharist by Cookham’ favourite jazz band – the Fabulous Shirt-lifters, who added a joyous note as the church filled up. During the service the boys, girls and mens’ choirs under the Direction of Sara Wood, led the music with typical musicality and enthusiasm. The setting of the Sanctus, by Bob Chilcott was particularly special. Real jazzy moments were added with MacDonald’s ‘Let Your Light Shine’ and ‘Plenty Good Room’ as the choirs showed their virtuosity. And instead of an organ voluntary as people dispersed the Jazz band again played a selection of spirituals and hymns – Including ‘ Down by the riverside’, ‘The Old Rugged Cross’ and the inevitable ‘When the Saints go marching in’ and left the congregation taping their feet and rocking in the aisles.